You can show tagline below logo with help of this code. Just copy this code and paste child theme function. After paste this code go to Appearance -> Customize -> Site Identity -> Display Site Title and Tagline -> Enable. 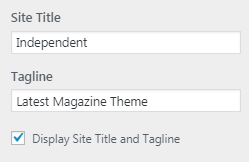 Magazine - How to Demo Import by Manual?